Photo Contests - Pineland Farms, Inc. Eligibility: Entrants must be legal residents of the fifty (50) United States and the District of Columbia and at least eighteen (18) years old at the time of entry. Agreement to Official Rules: By participating, entrants agree to these Official Rules and Sponsor’s decisions, which are final and binding in all matters related to this contest. Timing: The contest begins on January 2, 2019 at 7:00 am Eastern Daylight Time (“EDT”) and ends February 6, 2019 at 11:00 pm EDT (the “Contest Period”). How to Enter: We want to see your winter photos of skiing, snowshoeing & sledding. Share a photo to Instagram using hashtag #winterpinelandfarms. The photo must be winter themed, located at Pineland Farms and your own original photography. 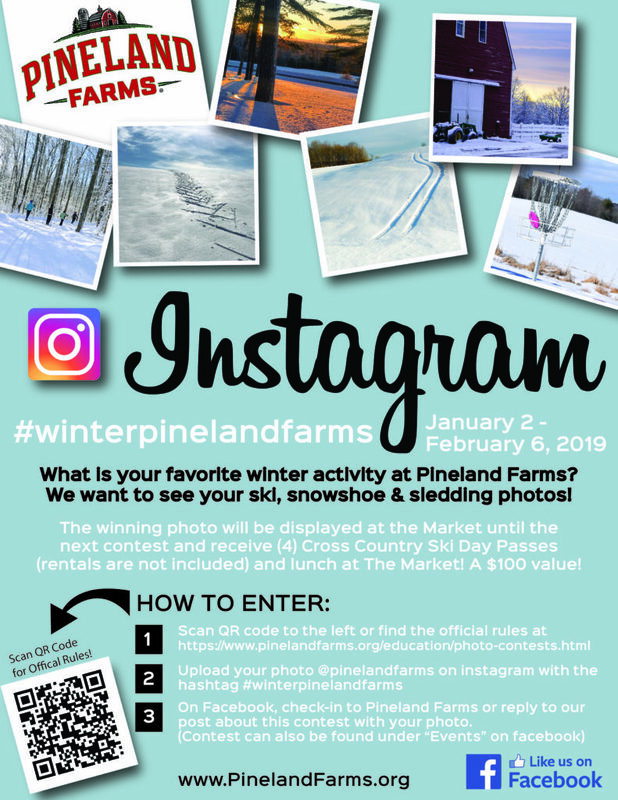 To enter via Facebook, reply to Pineland Farms #winterpinelandfarms Facebook wall post with your photo and #winterpinelandfarms. Multiple entries are allowed. Upon posting the photo, you will automatically be entered into the Contest. You must be a member of Facebook or Instagram in order to participate. Go to www.facebook.com or www.instagram.com to open a free account if you do not already have one. Your Instagram account must be set to the “public” setting. Winner Selection: The winner will be selected via a panel of judges made up of representatives from Sponsor within one (1) week after Contest Period. Odds of winning are dependent upon number of entries received. The winner will be notified on Facebook or Instagram. The winner will have forty-eight (48) hours to respond to a prize notification message from Pineland Farms or an alternate winner may be selected. Sponsor may report, as required by applicable statute or regulation, the value of prize and the identity of the winner, to appropriate taxing authorities. Except as specifically provided herein, the Grand Prize is guaranteed to be awarded. Winner Requirements: By participating in the contest, each entrant agrees and consents that Sponsor and its designees may use the entrant’s contest entry photo, Instagram and/or Facebook name or handle (ID), message, likeness, and/or prize information for promotional, advertising or other purposes, worldwide, in any and all media now known or hereafter devised, including the internet, without limitation and without further payment, notification, permission or other consideration, except where prohibited by law. Each entrant will indemnify Sponsor against all claims, damages, liabilities, and expenses (including reasonable attorney fees and legal expenses) arising out of any breach of these terms. Prize: Grand Prize: Four (4) ski day passes and lunch at the Market for a family or group of up to four (4). General Conditions: Sponsor reserves the right to disqualify any individual in violation of the Official Rules, cancel, suspend and/or modify the giveaway, or any part of it, if any fraud, circumvention of the rules by one or more entrants, technical failures or any other factor impairs the integrity or proper functioning of the giveaway, as determined by Sponsor in its sole discretion. Limitations of Liability: By participating in this giveaway and if chosen as a winner and accepting a prize, entrants agree that Sponsor and its affiliates and agents shall not be liable for any and all losses, damages, rights, claims, and actions of any kind in connection with the giveaway or resulting from the winner’s participation in the giveaway, acceptance, possession, use, misuse, of any prize, including without limitation, personal injury, death, and property damage and claims based on publicity rights, privacy or defamation. Winner: Winning Photo will be posted on Facebook and Instagram within one (1) week after Contest Period. For a printable version of the Photo Contest Rules, click here.